Task Manager is a utility included in Windows that shows you what programs are running on your computer. Task Manager also gives you some limited control over those running tasks. What Is Task Manager Used For? For an advanced tool that can do an incredible number of things, most of the time the Windows Task Manager is used to do something very basic: see what's running right now. Open programs are listed, of course, as are programs that are running "in the background" that Windows and your installed programs have started. Task Manager can be used to forcefully end any of those running programs, as well as to see how much individual programs are using your computer's hardware resources and which programs and services are starting when your computer starts. See Task Manager: A Full Walkthrough for every detail about Task Manager. You'll be amazed at how much you can learn about the software that's running on your computer with this utility. There is no shortage of ways to open Task Manager, which is probably a good thing considering that your computer may be suffering some kind of problem when you need to open it. Let's start with the easiest way first: Ctrl+Shift+Esc. Press those three keys together at the same time and Task Manager will launch. CTRL+ALT+DEL, which opens the Windows Security screen, is another way. Like with most keyboard shortcuts, press the Ctrl, Alt, and Del keys at the same time to bring up this screen, which includes an option to open Task Manager, among other things. In Windows XP, this shortcut opens Task Manager directly. You can also start the Task Manager directly using its run command. Open a Command Prompt window, or even just Run (Win+R), and then execute taskmgr. Task Manager is also available on the Power User Menu. Task Manager is a well-designed tool in the sense that it's organized and easy to move around in but is hard to fully explain because there are so many hidden options. In Windows 10 & Windows 8, Task Manager defaults to a "simple" view of the running foreground programs. Tap or click More details at the bottom to see everything. The Processes tab contains a list of all the running programs and apps on your computer (listed under Apps), as well as any Background processes and Windows processes that are running. From this tab, you can close running programs, bring them to the foreground, see how each is using your computer's resources, and more. Processes is available in Task Manager as described here in Windows 10 and Windows 8 but most of the same functionality is available in the Applications tab in Windows 7, Vista, and XP. The Processes tab in those older versions of Windows most resembles Details, described below. The Performance tab is a summary of what's going on, overall, with your major hardware components, like your CPU, RAM, hard drive, network, and more. From this tab you can, of course, watch as usage of these resources changes, but this is also a great place to find valuable information about these areas of your computer. For example, this tab makes it easy to see your CPU model and maximum speed, RAM slots in use, disk transfer rate, your IP address, and lots more. Performance is available in Task Manager in all versions of Windows but is much improved in Windows 10 and Windows 8 compared to earlier versions. A Networking tab exists in Task Manager in Windows 7, Vista, and XP, and contains some of the reporting available from the networking related sections in Performance in Windows 10 & 8. The App history tab shows the CPU usage and network utilization that each Windows app has used between the date listed on the screen through right now. This tab is great for tracking down any app that might be a CPU or network resource hog. App history is only available in Task Manager in Windows 10 and Windows 8. The Startup tab shows every program that starts up automatically with Windows, along with several important details about each, probably most valuable a startup impact rating of High, Medium, or Low. This tab is great for identifying, and then disabling, programs that you don't need to be running automatically. Disabling programs that auto-start with Windows is a very easy way to speed up your computer. Startup is only available in Task Manager in Windows 10 and 8. The Users tab shows every user that's currently signed in to the computer and what processes are running within each. This tab isn't particularly useful if you're the only user signed in to your computer, but it's incredibly valuable for tracking down processes that might be running under another account. Users is available in Task Manager in all versions of Windows but only shows processes per-user in Windows 10 and Windows 8. The Details tab shows every individual process that's running right now - no program grouping, common names, or other user-friendly displays here. This tab is very helpful during advanced troubleshooting, when you need to easily find something like an executable's exact location, its PID, or some other piece of information you haven't found elsewhere in Task Manager. Details is available in Task Manager in Windows 10 and Windows 8 and most resembles the Processes tab in earlier versions of Windows. 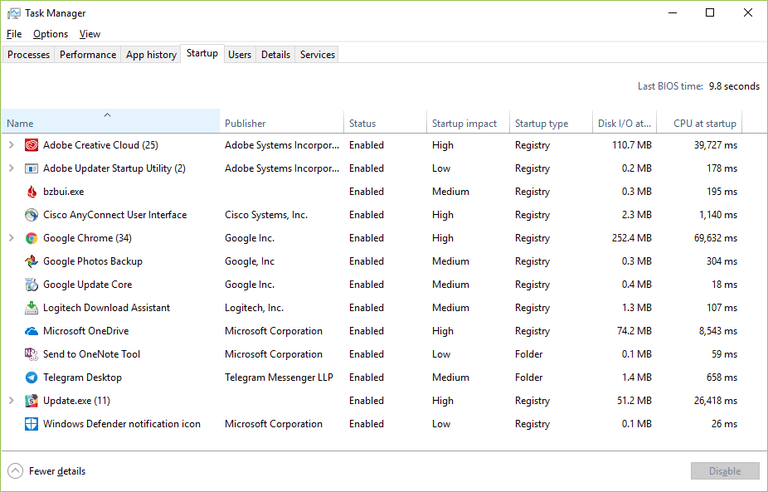 The Services tab shows at least some of the Windows services installed on your computer. Most services will be Running or Stopped. This tab serves as a quick and convenient way to start and stop major Windows services. Advanced configuration of services is done from the Services module in Microsoft Management Console. Services is available in Task Manager in Windows 10, 8, 7, and Vista. Task Manager is included with Windows 10, Windows 8, Windows 7, Windows Vista, and Windows XP, as well as with Server versions of the Windows operating system. Microsoft improved Task Manager, sometimes considerably, between each version of Windows. Specifically, the Task Manager in Windows 10 & 8 is very different than the one in Windows 7 & Vista, and that one very different than the one in Windows XP. A similar program called Tasks exists in Windows 98 and Windows 95 but doesn't offer near the feature set that Task Manager does. That program can be opened by executing taskman in those versions of Windows.